Background and objective: Previous studies have demonstrated that tissue Doppler echocardiography and two-dimensional speckle tracking echocardiography are minimally invasive imaging methods used to screen for coronary atherosclerotic heart disease. However, they are not highly sensitive and specific for patients with suspected heart disease presenting with normal ventricular wall motion or for patients with early coronary heart disease. The newly emerging three-dimensional longitudinal strain imaging technology can overcome these shortcomings and has become a relatively mature technique for quantitative assessment of myocardial function. The left ventricular global longitudinal peak strain (LVGLPS) measured by three-dimensional longitudinal strain imaging technology contributes to early diagnosis of high-risk coronary atherosclerotic heart disease. Design: Single-center, open-label, diagnostic trial. 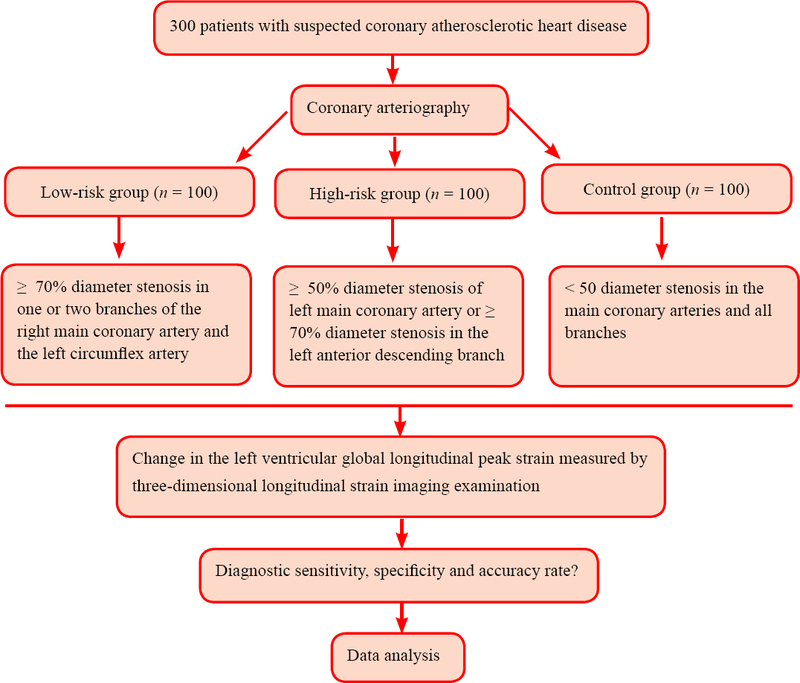 Methods: Three hundred older adult patients with suspected coronary atherosclerotic heart disease receiving treatment from January 2013 to December 2017 at the Department of Ultrasound Medicine, Taihe Hospital of China, are being included in this study. These patients will be divided into three groups: low-risk group (n = 100; ≥ 70* diameter stenosis in one or two branches of the right main coronary artery and the left circumflex artery), high-risk group (n = 100; ≥ 50* diameter stenosis in the left main coronary artery or ≥ 70* diameter stenosis in the left anterior descending branch), and control group (n = 100; < 50* diameter stenosis in the main coronary arteries and all branches). All patients will undergo conventional echocardiography followed by three-dimensional longitudinal strain imaging to measure the LVGLPS. The LVGLPS will be compared among the three groups. Outcome measures: The primary outcome measure is the sensitivity of the LVGLPS for prediction of coronary atherosclerotic heart disease. The secondary outcome measures are: (1) the specificity, positive predictive value, negative predictive value, positive likelihood ratio, negative likelihood ratio, and accuracy rate of the LVGLPS for prediction of coronary atherosclerotic heart disease; (2) change in the LVGLPS; (3) change in conventional echocardiography parameters; and (4) change in the receiver operating characteristic curve for prediction of high-risk coronary atherosclerotic heart disease using the LVGLPS. Discussion: The findings from this study will help to confirm that three-dimensional longitudinal strain imaging technology is highly sensitive and specific for patients with abnormal coronary arteries with suspected coronary heart disease but who present with normal ventricular wall motion. The change in the LVGLPS contributes to early diagnosis of high-risk coronary atherosclerotic heart disease in older adult patients. This helps clinicians to diagnose early coronary heart disease and take timely strategies to avoid serious cardiovascular events as much as possible. Ethics and dissemination: This study will be performed in accordance with the Declaration of Helsinki. All patients are informed of the study protocol and procedure and provide written informed consent. This trial was approved by Taihe Hospital (Affiliated Hospital of Hubei University of Medicine) (approval number: ethics No. 2013(03)) in January 2013. Participant recruitment and data collection began in January 2013 and will continue through December 2017. Outcome measure analysis will be performed and the trial will be completed in January 2018. Results will be disseminated through presentations at scientific meetings and publications in peer-reviewed journals. Trial registration: This trial was registered with the Chinese the Clinical Trial Registry (registration number: ChiCTR-DDD-17012839). Early diagnosis and timely treatment of patients with coronary heart disease can lower the risk of sudden cardiac heath. With the advent of new ultrasound technology and creation of highly specialized ultrasound devices, early noninvasive detection of myocardial ischemia will become possible.,,,,, Previous studies have demonstrated that tissue Doppler echocardiography and two-dimensional speckle tracking echocardiography are minimally invasive imaging methods for detection of coronary artery disease, but they are not highly sensitive and specific for patients with suspected heart disease presenting with normal ventricular wall motion or patients with early coronary heart disease.,,,,, The newly emerging three-dimensional longitudinal strain imaging technology can overcome these shortcomings and has become a relatively mature technique for quantitative assessment of myocardial function. Three-dimensional longitudinal strain imaging is based on the spatial nature of myocardial motion. It is a reliable technique used to quantitatively evaluate myocardial function. The left ventricular global longitudinal peak strain (LVGLPS) measured by three-dimensional longitudinal strain imaging is a relatively sensitive index used to predict high-risk coronary heart disease. The purpose of this study is to validate the hypothesis that changes in the LVGLPS contribute to early diagnosis of high-risk coronary atherosclerotic heart disease in older adult patients. This study began at the Department of Ultrasound Medicine, Taihe Hospital of China in January 2013 and will be completed in January 2018. Three hundred older adult patients with suspected coronary atherosclerotic heart disease who received treatment at the Department of Ultrasound Medicine, Taihe Hospital of China are being included in this study. Patient recruitment started in January 2013. Based on the number of patients with coronary atherosclerotic heart disease previously admitted to our hospital (about 60 patients per year), recruitment of patients is expected to last 4 years. Three days from admission to completion of the echocardiography examination. Three hundred eligible patients have been included. Older adult patients with suspected coronary atherosclerotic heart disease who receive treatment from January 2013 to December 2017 at the Department of Ultrasound Medicine, Taihe Hospital of China are being included in this study. Eligible patients will be informed of the precise contents of the study. Only patients who have provided written informed consent will be included. The included patients will be non-randomly grouped. The experimental protocol is shown in [Figure 1]. Figure 1: Study protocol flowchart. All 300 patients with suspected coronary atherosclerotic heart disease will be divided into three groups according to their coronary angiography findings. The low-risk group (n = 100) comprises patients presenting with ≥ 70% diameter stenosis in one or two branches of the right main coronary artery and the left circumflex artery. The high-risk group (n = 100) comprises patients presenting with ≥ 50% diameter stenosis of left main coronary artery or ≥ 70% diameter stenosis in the left anterior descending branch. The control group (n = 100) comprises patients presenting with < 50% diameter stenosis in the main coronary arteries and all branches. All patients will undergo color Doppler ultrasonography using a Vivid E9 diagnostic ultrasound system (General Electric Medical Systems, Milwaukee, WI, USA) with an M5S probe frequency of 1.7 to 3.3 MHz. The patients will be examined while lying in the left lateral decubitus position. An echocardiography machine will be used to collect two-dimensional images of the heart. Related parameters will be calculated. The 4-V probe frequency will be regulated at 1.7 to 3.3 MHz. The heart will be segmented using a TomTec workstation. Electrocardiographically gated full-volume images will be acquired. The frame rate will be designated as > 40% of the heart rate of the examined patient. The patient will be asked to stop breathing at the end of a relaxed expiration. Dynamic full-volume images of three consecutive cardiac cycles will be collected. The four-dimensional “Volume” mode will be used. The “EDV” key will first be pressed, and then the “AUTO” key will be pressed. Thus, the system automatically wraps the endocardium. Manual adjustment will be performed if the outcome is unsatisfactory. The touch screen keys on the screen are pressed in order. The LVGLPS values of 17 segments will be automatically produced by the diagnostic ultrasound system. The primary outcome measure is the sensitivity of the LVGLPS for prediction of coronary atherosclerotic heart disease. This is also called the true positive rate; i.e., the percentage of patients correctly identified as having coronary atherosclerotic heart disease among all patients included. Higher sensitivity indicates a higher correct rate of screening. The specificity, positive predictive value, negative predictive value, positive likelihood ratio, negative likelihood ratio, and diagnostic accuracy rate of the LVGLPS for prediction of coronary atherosclerotic heart disease. Specificity, i.e., true negative rate: the percentage of healthy people who are correctly identified as not having coronary atherosclerotic heart disease. Higher specificity indicates a higher correct rate of diagnosis. Positive predictive value: The proportion of patients with positive diagnostic test results that are truly positive. This reflects the probability that patients with positive results actually have coronary atherosclerotic heart disease. Negative predictive value: The proportion of patients with negative diagnostic test results that are truly negative. Positive likelihood ratio: The ratio of the percentage of truly positive patients diagnosed by the gold standard to the percentage of false-positive patients. Negative likelihood ratio: The ratio of the false-negative rate to the true-negative rate. When the positive likelihood ratio is > 10.0 or the negative likelihood ratio is < 1.0, the probability of coronary atherosclerotic heart disease is increased. Diagnostic accuracy rate: Diagnostic accuracy rate = [(number of positive patients with positive test results + number of negative patients with negative test results) / total number of patients] × 100%. Change in the LVGLPS as detected by the Vivid E9 diagnostic ultrasound system. Change in conventional echocardiography parameters including the end-diastolic volume index, end-systolic volume index, left ventricular ejection fraction, mitral inflow peak early diastolic velocity (E), velocity at atrial contraction (A), and early (Ea) and late (Aa) diastolic mitral annular velocities. The E/A and Ea/Aa will be calculated. Change in the receiver operating characteristic (ROC) curve for prediction of high-risk coronary atherosclerotic heart disease using the LVGLPS. The ROC curve will be established, and the appropriate threshold for predicting high-risk coronary atherosclerotic heart disease using the LVGLPS will be calculated. The area under the curve (AUC) will also be calculated. When the AUC is > 0.5, the accuracy rate increases as the value more closely approaches 1.0. [Table 1] shows the diagnostic accuracy rate corresponding to the AUC. The study protocol was approved by the ethics committee, and a protocol agreement was signed. All researchers fully understand the study protocol and clinical operation. Regular audits will be performed during patient recruitment. These audits will ensure that the included patients are eligible, the trial is performed in strict accordance with the study protocol, and all collected data are complete. At the end of patient recruitment and all trial procedures, a final visit will be performed to ensure that the relevant records are complete and accurate. All data will be statistically analyzed using SPSS13.0 software (SPSS, Chicago, IL, USA) according to the intention-to-treat principle. Normally distributed measurement data will be expressed as mean, standard deviation, minimum, and maximum. Non-normally distributed data will be expressed as lower quartile (q1), median, and upper quartile (q3). The chi-square test will be used to compare the sensitivity, specificity, positive predictive value, negative predictive value, positive likelihood ratio, negative likelihood ratio, and accuracy rate of the LVGLPS for prediction of coronary atherosclerotic heart disease among the groups. One-way analysis of variance and the least significant difference test will be used to compare homogenous LVGLPS values among the groups. Dunnett’s T3 test will be used to compare nonhomogeneous LVGLPS values among the groups. In accordance with our experience, we hypothesized that both the sensitivity and specificity of the LVGLPS for prediction of coronary atherosclerotic heart disease are 90%. With a significance level of α = 0.05 (two-sided), б = 0.05, and μ0.05 = 1.96, the final effective sample size of n = 139 per group was calculated according to the formula [μα × p × (1 − p)] / б, in which p is sensitivity or specificity. Assuming a patient loss rate of 20%, 167 patients per group are required. According to the inclusion and exclusion criteria, we will include 100 patients in each group. The inspection level is α = 0.05 (two-sided). The estimated patient loss rate is ≤ 20%. Patients will be eliminated from the study if their records are lost. Corresponding numbers of new patients will then be used to supplement the missing data. The entire trial process strictly enforces clinical trial quality management. All paper case report forms are complete, true, clear, and objective. All data will be entered into a computer, which will be locked and stored. After accuracy confirmation, the data recorded in the database will be audited by the data manager, researchers in charge, statisticians, sponsor, and supervisory managers. The database will then be password-protected and the data will not be altered. Anonymized trial data will be published at www.figshare.com . The clinicians involved in the protocol conduction have a wealth of medical imaging experience. During the clinical trial, the sponsor inspectors will conduct regular periodic visits to the research center to ensure that all aspects of the research program are strictly adhered to. Additionally, the original data will be checked to ensure that the contents of the case report forms are correct and complete. This clinical trial follows the relevant laws and regulations of the Helsinki Declaration. We adhered to the SPIRIT guidelines when drafting this manuscript (Additional file 1 [Additional file 1]). The researchers are responsible for providing the independent ethics committee with the clinical trial protocol and informed consent and for providing the patients with related information materials. The trial was not initiated until approval was received by the ethics committee. This study was approved by the Ethics Committee of Taihe Hospital (Affiliated Hospital of Hubei University of Medicine) of China (approval number: ethics No. 2013(03)). This trial was registered with the Chinese Clinical Trial Registry (registration number: ChiCTR-DDD-17012839). Participant recruitment is expected to be completed by December 2017. Data analysis will be performed in January 2018. Preliminary experiments have been performed. Three-dimensional longitudinal strain imaging was performed in 102 older adult patients with suspected coronary atherosclerotic heart disease. Conventional echocardiography showed that the LVGLPS was decreased in patients with high-risk coronary atherosclerotic heart disease but with normal ventricular wall motion. In this study, three-dimensional longitudinal strain imaging technology will be used to detect whether changes in the LVGLPS exist in older adult patients with suspected coronary atherosclerotic heart disease but with normal ventricular wall motion. Findings from this study will provide clinical evidence for diagnosis and subsequent treatment of coronary atherosclerotic heart disease and help lower the risk of sudden cardiac death. A comprehensive diagnostic trial protocol will be used, which will help to detect markers for early diagnosis of high-risk coronary atherosclerotic heart disease. Three-dimensional longitudinal strain imaging technology is highly sensitive and specific for the detection of coronary atherosclerotic heart disease. Three-dimensional longitudinal strain imaging can reflect the true myocardial motion, but its ultrasound image quality requirements are high, and the frame rate should be up to 40 frames/s. This should be supported by a radiologist’s skillful operation and advanced equipment. Whether the difference in the LVGLPS among the groups is significant and whether the difference is associated with vascular stenosis require investigation in future studies. Three-dimensional longitudinal strain imaging technology is used to detect the change in the LVGLPS in older adult patients with high-risk coronary atherosclerotic heart disease who present with normal ventricular motion as confirmed by conventional echocardiography. This is expected to contribute to early diagnosis and timely treatment of coronary heart disease, which avoids the occurrence of serious cardiovascular adverse events as much as possible. Chu CY, Su HM, Hsu PC,et al. Impact of chronic kidney dis ease in early invasive versus early conservative revascularization strategies in non-ST-segment elevation acute coronary syndromes: a population-based study from NHIRD of Taiwan. Nephron Clin Pract. 2013;124:38-46. Toth PP. Subclinical atherosclerosis: what it is, what it means and what we can do about it. Int J Clin Pract. 2008;62:1246-1254. Kindermann W. Cardiovascular side effects of anabolic-androgenic steroids. Herz. 2006;31:566-573. Clark LT. Issues in minority health: atherosclerosis and coronary heart disease in African Americans. Med Clin North Am. 2005;89:977-1001. Health Quality Ontario. Biventricular pacing (cardiac resynchronization therapy): an evidence-based analysis. Ont Health Technol Assess Ser. 2005;5:1-60. Urbano-Moral JA, Patel AR, Maron MS, et al. Three-dimension al speckle-tracking echocardiography: methodological aspects and clinical potential. Echocardiography. 2012;29:997-1010. Xie MY, Lv Q, Wang J, Yin JB. Assessment of myocardial seg mental function with coronary artery stenosis in multi-vessel coronary disease patients with normal wall motion. Eur Rev Med Pharmacol Sci. 2016;20:1582-1589. Enomoto M, Ishizu T, Seo Y, et al. Myocardial dysfunction iden tified by three-dimensional speckle tracking echocardiography in type 2 diabetes patients relates to complications of microangiopathy. J Cardiol. 2016;68:282-287. Lipiec P, Wejner-Mik P, Wdowiak-Okrojek K, et al. Fusion of morphological data obtained by coronary computed tomography angiography with quantitative echocardiographic data on regional myocardial function. Cardiol J. 2016;23:264-269. Narimani S, Hosseinsabet A, Pourhosseini H. Effect of coro nary slow flow on the longitudinal left ventricular function assessed by 2-dimensional speckle-tracking echocardiography. J Ultrasound Med. 2016;35:723-729. Başaran Ö, Tigen K, Gözübüyük G, et al. Predictive role of left atrial and ventricular mechanical function in postoperative atrial fibrillation: a two-dimensional speckle-tracking echocar diography study. Turk Kardiyol Dern Ars. 2016;44:45-52. Zhang H, Luo XR, Liu GJ, Zhao XY, Quan TD. Quantitative assessment of long-axis systolic function of left ventricle by two-dimensional strain echocardiography in healthy subjects. Shiyong Yixue Zazhi. 2012;28:4093-4096. Jasaityte R, Heyde B, D’Hooge J. Current state of three-dimensional myocardial strain estimation using echocardiography. J Am Soc Echocardiogr. 2013;26:15-28. Zhang RF, Weng YJ, Song Y, Sun LL, Zheng Q, Lei LB. Assessment of left atrial strain in healthy subjects by three-dimension speckle tracking imaging. Zhonghua Chaosheng Yingxiang Xue Zazhi. 2013;22:572-575. Bai G, Gou CL, Zhang ZL, Zhang WJ. Early prediction of high- risk coronary artery disease by three-dimensional strain imaging. Linchuang Chaosheng Yixue Zazhi. 2016;18:730-733. Kleijn SA, Aly MF, Terwee CB, et al. Three-dimensional dimensional speckle tracking echocardiography for automatic assessment of global and regional left ventricular function based on area strain. J Am Soc Echocardiogr. 2011;24:314-321. Liu GB, Zhang GP, Ren QY, et al. Classification of ankle injury on radiography and magnetic resonance imaging: study protocol for a retrospective, self-controlled, clinical trial with 3-month followup. Clin Transl Orthop. 2016;1:170-176. WJZ designed the study protocol. KWH, HL, and GB are conducting the trial. KWH and HL are collecting the data. All authors approved the final version of this manuscript. This trial was approved by Taihe Hospital (Affiliated Hospital of Hubei University of Medicine) (approval number: ethics No. 2013(03)) in January 2013. The study followed international and national regulations in accordance with the Declaration of Helsinki and relevant ethical principles. The authors certify that they obtained participant consent forms. In the form, patients provided consent for their images and other clinical information to be reported in the journal. Patients understand that their names and initials will not be published and while due efforts will be made to conceal their identity, anonymity cannot be guaranteed.